The basic premise of the book is outlined by Becan's brother in the Foreword. Basically, over the course of a few years, Becan (with the aid of some others) used a ouija board to contact dead people on Nantucket Island. Becan recorded their questions and answers, which then became the very structure of the book. 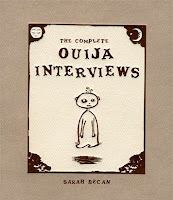 The questions are presented as captions in a handwritten script, while the answers are relayed by illustrated ghosts whose speech is rendered in a font very reminiscent of 'classic' ouija boards. The book is a series of vignettes, each focusing on one or two characters with distinct personalities and agendas. 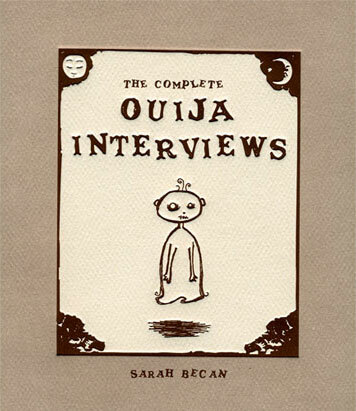 The illustrations are very charming (the illustration here is what Becan inscribed and drew in my copy) and speak to the innocence with which I think a lot of people like to place on the Ouija board. It's more of a game than a "true" manner to converse with the deceased. And, as is customary for ouija games, both the questions and answers tend to be short, often only one or two word sentences. Consequently, the whole would be easy (and probably even attractive) for a child to pick up and read through, even if they didn't quite understand all of the ideas behind it. I'm actually glad I discovered this in a "full" book form instead of the shorter minicomics Becan had done originally. The reason is that the 192-page book provides a good range of ethereal discussions, from the morbid to the funny to the inspiring. I think that the full collection that runs the gamut of human drama provides a more complete contrast between life and death than the individual minicomics could. I also think that if I read a single minicomic, I would've written it off as a one-note bit that didn't have anywhere to go. But The Complete Ouija Interviews shows quite a wide range of possibilities and comes across very well as a complete package. Despite the subject matter -- life and death -- the book only lightly touches on their historical arbiters: religion. And in the couple of instances where religion is brought up, it's still left fairly ambiguous as to which religion is "right" or, indeed, if any of them are. Personally, I don't believe in ghosts or an afterlife. But I have played with ouija boards before, and know the basic process of how they work. Becan's books comes across as very genuine in that respect. Coupled with her simple illustrations, the short stories, especially when viewed as a collective whole, read as holistic truth. As the interview with Richard Patterson notes: "Sometimes life gets too hard / but hang on / it is worth it." And that's really what The Complete Ouija Interviews gets down to: "it is worth it." It's plainly evident what judges saw in this book when they awarded it a Xeric back in November, and it's a book I heartily endorse. It can be purchased at the Shortpants Press website for $10.